Recently MR whole-heart imaging has emerged as a new technique for visualization of the coronary arteries without requiring radiation or contrast agent. 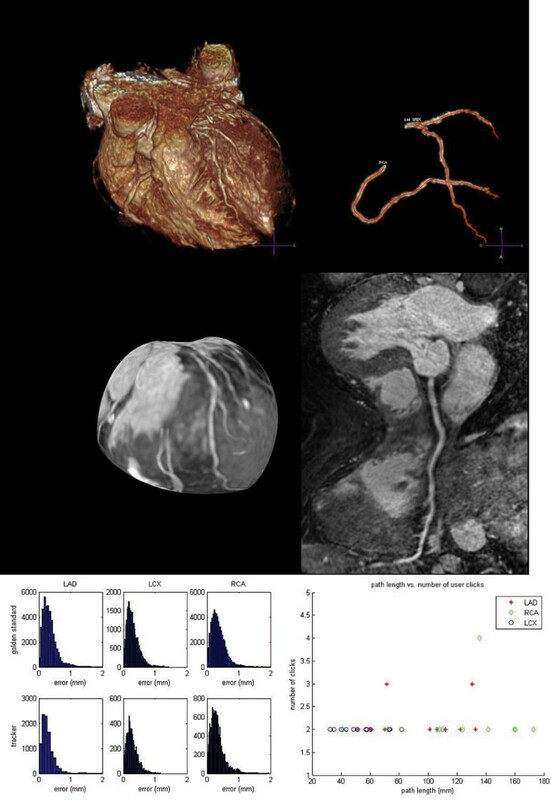 Although detection of coronary disease on whole-heart MR data is still a subject of research , reconstruction of the coronary vascular tree for advanced 3D visualization can give valuable information in combination with 2D quantitative cardiac MR analysis. To visualize the coronary arteries using globe view or curved planar reformats, the coronary central vessel axis (CVA) is needed. We developed a method to semi-automatically track the CVA in MR whole-heart data. These visualization techniques will only be useful in clinical practice if paths are tracked through the correct vessels, if locally a path gives an accurate description of the vessel direction and if the required user interaction is minimal. Our method satisfies these requirements. Our tracking algorithm is similar to the approach described in . Given a user-defined start and end point a centerline is tracked between them. To validate the tracking algorithm we focused both on accuracy and required user interaction. To create an unbiased golden standard we developed a dedicated manual path tracking application. With this application four expert users delineated the Right Coronary Artery (RCA), the Left Anterior Coronary Artery (LAD) and the Left Circumflex coronary artery (LCX) in 12 patients from their anatomical start point up to the point where they were not visible anymore. This resulted in 144 paths. An adapted version of the Repeated Averaging Algorithm (RAA)  was used to create a golden standard from each set of four paths. The RAA was adapted to average N open 3D input lines (N > 1). After overlapping line parts were computed the lines were averaged in 3D. For regularization at the start and end of the paths, the distance between a user-defined path point and the corresponding golden standard point was required to be smaller than 10 mm to contribute to computation of a new average. The inter-user variability was defined as the distance of the user-defined paths to the golden standard. Distances to the user-defined paths were computed along each golden standard path in steps of 0.1 millimeter (mm). Each golden standard path was tracked from start to end. If the path could not be found, a user-defined guide point was simulated by dividing the golden standard path in two parts of equal length and the tracking was repeated for each part. This was repeated until all path sections were tracked. After tracking, the RAA was used to compute the distance of the tracked paths to the golden standard. A path was rejected if the distance exceeded a threshold of 10 mm. The inter-user variability was 0.37 ± 0.35 mm for the LAD paths, 0.31 ± 0.20 mm for the LCX paths and 0.37 ± 0.26 mm for the RCA paths. All RCX and RCA paths were accepted. Of the 12 LAD paths one path failed due to a complete obstruction of 2.5 cm. The algorithm error for the accepted paths was 0.44 ± 0.93 mm for the LAD paths, 0.29 ± 0.19 mm for the LCX paths and 0.33 ± 0.25 mm for the RCA paths. Of the 36 golden standard paths, 32 paths could be tracked without an additional guide point. 2 paths required one additional guide point and 1 path required two additional guide points. From this validation we can conclude that our algorithm tracks the main coronary vessels with less interaction and with equal or higher accuracy than a skilled user with a state-of-the-art manual path tracking tool. (Figure 1). We developed an algorithm for semi-automatic tracking of coronary arteries in MR whole-heart images and demonstrate the algorithm tracks the coronary CVA with an equal or higher accuracy when compared to a skilled user using manual path tracking tools.